this is Bernhard from Tango-DJ.at, Association for preservation and provision of argentine Tango music and dance with a special January/February-edition of the monthly newsletter Tango-DJ.at about DJ-ing, special Tango CDs, Tango dancing and much more. This time it's rather a small book, so you migh consider it for weekend reading.. Enjoy! This newsletter is the largest and most important one in the history of Tango-DJ.at monthly newsletters. Therefore this edition is a special 2 months January/February edition. Thank you very much for your attention, we hope you enjoy this month's newsletter. We'd very much appreciate your feedback and comments on the content presented. In case you know somebody who might be interested in this newsletter please recommend it or place a link to Tango-DJ.at. With my activities getting more and more international and the projects getting larger and larger I decided to found Tango-DJ.at, a non profit association for preservation and provision of argentine Tango music and dance, organizing Tango events, maintaining the growing website Tango-DJ.at and starting new and challenging Tango projects. In addition to many different services and offerings by Tango-DJ.at of which you can read in this newsletter, Tango-DJ.at is starting a new challenging project. 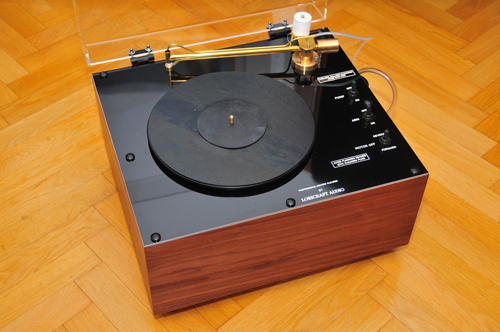 We are about to build up a professional workstation in order to produce state of the art transfers from Tango LPs and SPs (78 RPM records). The concept plans to respect highest archiving standards for producing the transfers, but making them available to the Tango community by publishing the transfers on CD or as digital product. There is a similar project in Buenos Aires (Tangovia), but there are lots of Tango records also here in Europe and our focus is not only to archive Tangos, but making them available to the Tango community. At the moment Tango-DJ.at is evaluating suitable equipment and raising funds for setting up this workstation dedicated to transfer Tango records. Transfers will be made in linear, stereo 24bit/192kHz recording, meeting the requirements of archiving, as well as optimized mono mix with suitable turnover and roll off frequency correction. Different qualities for remastering and playback purposes will be made available to the Tango community together with complete documentation of transfer process, meta data and cover pictures. 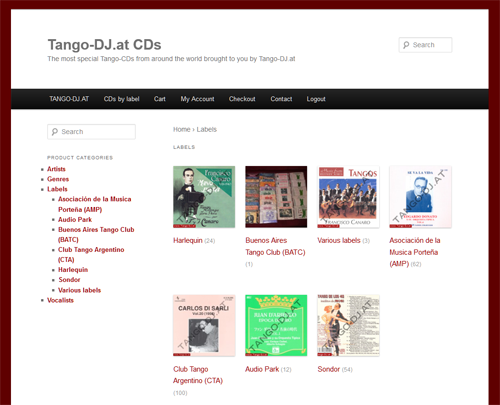 If you like our work, the information provided on Tango-DJ.at and our goal to make unknown Tangos stored on collectors LPs and SPs available to the Tango community please support us by buying original CDs from Tango-CDs.com, getting member of Tango-DJ.at or making a donation. Details about possible membership and benefits included will be published in the next newsletter. A donation via PayPal to office@tango-dj.at is possible with most credit cards, with or without a PayPal account and can be deducted from your income tax. We are using the same web server configuration and contract (not taking into consideration small add-ons for memory) for exactly 10 years now. Considering the development of computer systems this seems like a miracle that our server did its job for ten years now. But changing to a modern CMS system to be able to present CDs in the best possible way and providing downloads is pushing our old, reliable web server above its capabilities. So Tango-DJ.at is moving onto a brand new and high performance web server in order to provide the power needed to smoothly run the new services of Tango-DJ.at like the Tango Database and Tango-DJ.at/shop system. If everything works fine you do not notice these technical details in the background, but rest assure that it takes a pile of money each month to be able to provide smooth web services to you for free. We are looking forward to running our Tango-DJ.at website with MORE POWER for many more years for all of you Tango aficionados worldwide! It was planned for a long time to bring information about Tango recordings onto the website as a database driven system. One big challenge is to implement this information in the website, but the much bigger challenge is to collect and work on the information in the first place. 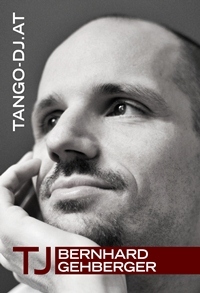 So finally we made it and about ~45.000 Tango recordings being published on CDs went online. 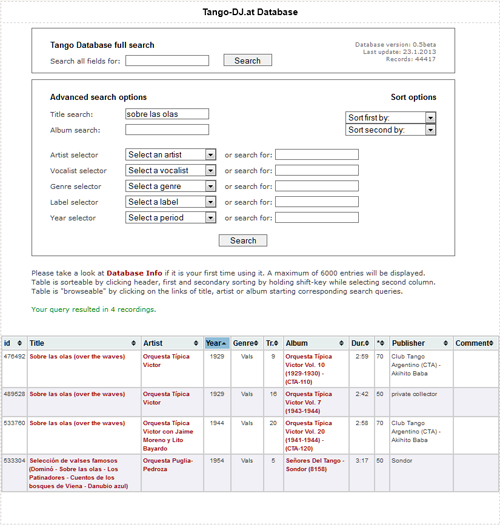 There is a simple as well as advanced search functions are provided to search the Tango database. Please find more information about the available functions on the database information page. This database and the information within is provided as beta-version and lots of work has still to be done in order to correct mistakes, solve conflicting meta data and unclear information about recording dates, vocalists and much more. In the future we will also add the information about recordings on LPs and SPs as we make transfers for Tango-DJ.at, Association for preservation and provision of argentine Tango music and dance. End of December 2012 the Tango-DJ.at CD shop went online and can be found under Tango-DJ.at/shop or Tango-CDs.com. We are proud to maintain the largest stock of AMP (200 CDs) and CTA (400 CDs) worldwide being able to ship any available CD of AMP or CTA within a day. Plenty of the CDs still being in stock can also not be found anywhere else. We also try to offer more and more sound samples as new CDs are being added. In case you are concerned about 4% fees getting deducted by PayPal you may choose bank transfer as payment method and transfer the amount due via private PayPal transaction as most of you did before. If you like our offer, please let people know about this new possibility to obtain very special and rare Tango CDs via Tango-DJ.at/shop - Tango-CDs.com! With every CD you get from us you are supporting our work in making even more Tangos available in better quality. Some of you might have heard already of a new project called TangoTunes initiated and run by Christian Xell. It was supposed to start in January 2013, but obviously experiences some delays. So what is TangoTunes going to be? Christian bought and gained access to Tango collections in Buenos Aires last year. LPs are transferred by his staff, SPs in cooperation with TangoVia. (a project to archive Tangos, situated in Buenos Aires) Transfers of both (LPs and SPs) are going to be offered as downloads by TangoTunes GmbH. on tangotunes.com very much like we know it from a very similar sounding webservice. It will feature prelistening possibility as well as single track purchase in different qualities. Producing transfers and offering them as digital downloads open up new possibilities. One of them is the possibility to offer files up to 24bit/192kHz, instead of the usual 16bit/44kHz CD quality ones. Since most of us are not at all familiar with anything beyond CD quality we strongly suggest to take a look into the technical details. This can be done by reading scientific papers which are hard to understand, or articles like this one "24/192 music downloads ...and why they make no sense" where techincal stuff is presented in a rather colloquial way. Summarizing the lengthy article above: Well, they do make sense, but you have to understand for what. Using 24bit/96kHz-192khz does make sense when producing transfers for archiving and remastering purposes. Choose this format if you have professional equipment, software capable to work on those files and you want to spend several hours on each recording to tweak them to your ideas. Using 24bit/192khz for playback is not only pointless, but possibly even harmful to the quality of sound and quite likely also for the overall playback stability of your system. The marketing explanation 24bit is 1.5 times better than 16bit, and 192khz gives you more than 4 times better frequency-response is simply wrong. In addition, plenty of playback equipment most of non professionals are using for playback will react in an unpredictable way when switching between 16bit/44khz lossless or lossy codecs and 24bit/96kHz-192kHz files. Please test it before using them on your next gig! Tango-DJ.at is using highest quality 24bit/192kHz format for producing transfers for archiving and remastering purposes. For playback we recommend files in lossless CD quality 16bit/44kHz. Both will be offered for Tango-DJ.at transfers. For Tango-DJ.at Tango is not business, but lifestyle. As non-profit association we continue to research and publish extensive expert information about Tango music and other topics of Tango making it available for free. Considering the outstanding work which has been done by Tango-DJ.at so far and will be done by Tango-DJ.at & TangoTunes in the future it seems like Vienna is working on a worldwide reputation of becoming a city not only of classical, but also Tango music. Tango-DJ.at is looking forward to cooperate with TangoTunes in order to provide best Tango music for Tango aficionados from around the world! As you might know, there are some very nice recordings by Miguel Villasboas. Especially Milongas, but also Tangos and Valses. There are not too many CDs you can find. Most of them are published by Sondor and all of them are compilations of recordings originally published on LPs. Some under Sondor, some under Clave, a label which was bought later by Sondor. A big problem with almost all recordings by Miguel Villasboas is missing recording dates. With the help of Rafael, director of Sondor, I am proud to be able to provide you with the very first discography for Miguel Villasboas. At the moment it lists LPs and SPs only. To understand which versions were used to compile which CDs is a problem yet to be taken care of. I do hope to be able to figure out most of the recording dates being used on the CDs in the near future. As always, any additional information or feedback is very much appreciated. Everybody who attended the first edition last year noticed that this event has the potential to become a sought after Tango event. It is not a festival or festivalito and we do not want to call it a Tango marathon or Encuentro. So what is it? Well it is an event where international Tango dancers come together enjoying dancing with each other to the music of outstanding DJs while respecting the codigos of social Tango dance in a relaxed, friendly atmosphere created by a motivated team trying to maximize your experience. We do not want to exclude anybody, no matter of style or level, as long as you are capable and willing to respect our idea described above. If you have been to our last edition and you liked it, please spread the word and invite friends you want to be with us. Details about registration and this years' event will be published in about a month on the website Tango-DJ.at. Please mind that for most of these events registration is mandatory and if you are interested in taking part you have to find out about the registration modalities soon enough! This might be a once in a lifetime chance for you to get a complete collection of some BATC or CdT CD series in perfect condition and in one go. Please find a complete listing of the CDs on Tango-DJ.at/shop and full track listings on my BATC collection page. It is for sale on Tango-DJ.at/shop for 2200,- EUR, but you can get in contact with me and place your offer any time. 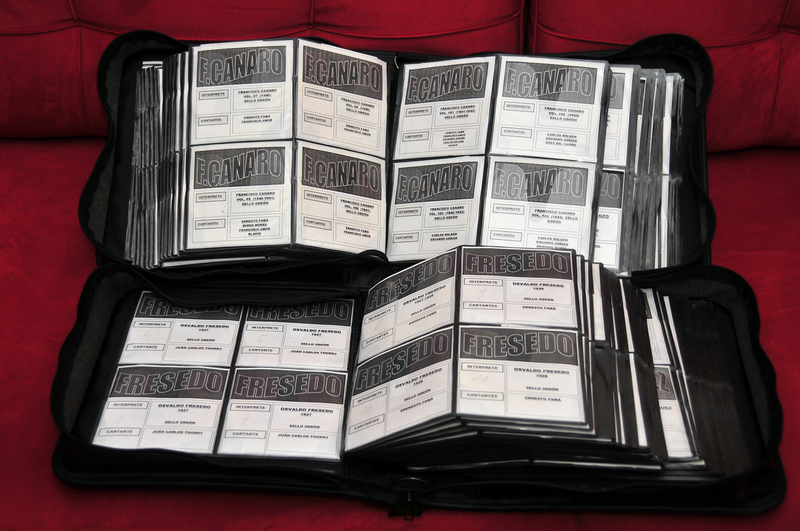 Even if you are staying long time in Buenos Aires you will not be able to get this amount of CdT-CDs. It literally takes years to carry together such a collection of compilations featuring lots of very rare tracks which can not be found anywhere else. Here and now you have the possibility to easily obtain the whole bunch at once. These 446 CDs are on sale for 4460,- EUR at Tango-DJ.at/shop. You can find the track listings of those CDs on the various collections page, Francisco Canaro collection page or searchable in the database. You can also get in contact with me and make your offer for this outstanding collection. It is well known, easily available and probably the main source of Aníbal Troilo recordings for most people. However, for their transfers and/or remastering massive filtering and other dynamic enhancing and compressing tools were used. It resulted in a slightly metallic sound and even worse, some frequencies which can be disturbing or even kind of painful on many sound systems. While working with those I caught myself to jump away from every track as fast as possible because it was simply unpleasant to listen to it. While working through those transfers I noticed that it is pleasant to listen to it. Very different from the new series described above. Of course there are exceptions and some transfers are not very good. Overall it has more hiss and noise, but the sound is natural and pleasant to listen to. Since the difference was so big I took a look at it as well (recording: "El marne"). The upper wave is showing the new remastered series, the lower the old one. As you can see massive compressor and most likely also other tools were used to push the sound for the newly remastered series. Plenty of the peaks were even cut off in order to be able to make everything even louder. 09. Quejas de bandoneón - Orquesta Rodolfo Biagi - 2:56 - ???? - Tango - Del "Glostora Tango Club"
10. Fuegos artificiales - Orquesta Juan D'Arienzo - 2:39 - 1946 - Tango - De "Ronda Musical de las Américas"
12. A la gran muñeca - Orquesta Carlos Di Sarli - 2:47 - 1952 - Tango - Audición "Pinceladas Porteñas"
13. Tiny - Orquesta Pedro Maffia - 2:18 - 1946 - Tango - De "Ronda Musical de las Américas"
16. La pifiada - Orquesta Armando Pontier - 2:43 - 1956 - Tango - Carnavales de "Huracán"
18. El buscapie - Orquesta Miguel Caló - 2:21 - 1946 - Tango - De "Ronda Musical de las Américas"
I reviewed the first three albums of this CD series published by Oriente Musik all of them featuring very rare and interesting Tangos from somewhere in Europe. All of the CDs come with an extensive CD booklet giving detailed information about the artists and recordings. You can take a look at one of the booklets as well as the track listings (including all the special characters if you are looking for them) at my CD listing of various labels. Todo Vals Vol. 2 - Serie Para Baile Vol. 3 - (CTA-1053)! This is something you can not spread often enough. Naomi put together the top ten tips of what Tango is all about. Please read, share and take it to your heart. Quite often people run into the situation to hear a Tango and getting the feeling to know the melody from somewhere else. Or you hear a piece of classical music and get confused because you think that you know the melody from an argentine Tango. Well Jens-Ingo took a detailed look into this topic in his latest blog which is highly recommended. Trud published a beautiful and informative Carlos Di Sarli timeline displaying vocalists Di Sarli recorded with.